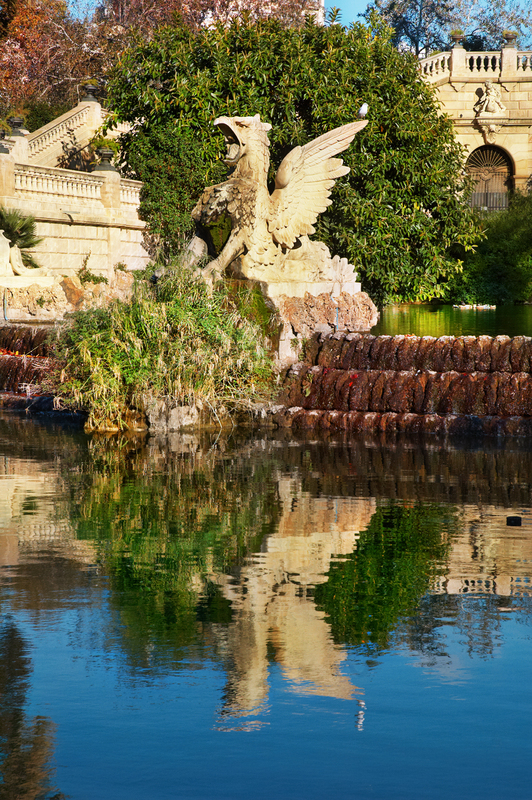 It is strange but before describing the stage which is the Cascade fountain at Parc de la Ciutadella and its history, I would like to show you one of the actors, a griffin (griffon or gryphon). Remember Harry Potter and the Prisoner of Azkaban? That beast they are trying to feed? Well, that was a hippogriff, the mixture of a horse and a griffin. A griffin has the body of a lion instead plus the common eagle traits. In the Cascade, there are four of them. The combination of the mythological being and its reflection really captivated me. I hope Aurora on the chariot back there (you will see tomorrow) is not jealous. It is evident that she has the leading part in this elaborate fountain. By the way, the four water-sprouting griffins were sculpted by the same artist that created the famous 7.2 m high statue of Columbus at Las Ramblas, his name, Rafael Atché (1854 - 1923). Once said that, check next post for the whole story. I find this quite captivating...perhaps you will show more of the park. It looks gorgeous! I love mythological creatures of all kinds so I was immediately attracted to your post. And to see such a gorgeous fountain and reflection — wonderful! Maravilloso el reflejo , Carlos. Tus fotos siempre son interesantes y lindas.